When it comes to swimming, what’s your favorite stroke? For those who raised their hands when freestyle is called out, the Freestyle Swimmer’s Snorkel is just the item for your perusal. 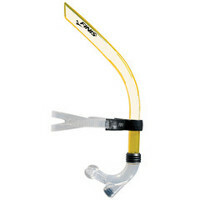 This snorkel basically allows the proper freestyle swimming stroke technique without having to take a breath to the side – definitely a way to “cheat” your way to a personal best. Of course, when it comes to the actual swimming event, you will still need to breathe some time or the other, so take this as a training tool as used by regular training programs by collegiate sports teams. It is attached to the wearer’s forehead with a strap, leaving more than enough space for swim goggles. This will help keep your head aligned with the spine while swimming, helping develop body balance, rotation, and alignment in the water durign the entire process so that a solid foundation can be laid for learning more advanced skills including bilateral breathing. $39.95 sounds like a bargain when it comes to being a training aid.